BookLust: TSS: What makes a book a keeper? 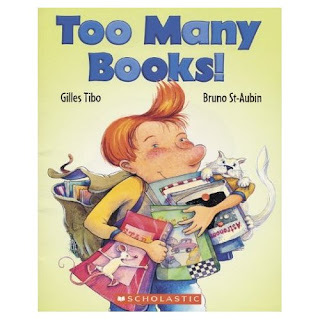 TSS: What makes a book a keeper? Sometimes, I look at my bookshelves, decide they look ridiculously cluttered, and try to clean them. This is made extremely difficult by the fact that I find it almost physically impossible to get rid of books. I put together a system of trying to place mass-market books in front of larger trade paperbacks or hardcovers. This doesn't work well, though, because then I can't see the title of the books in back. So instead, I employ a helter-skelter stacking system that makes my somewhat OCD sister cringe. It looks sloppy. In those instances, I will make a heroic (truly, it is heroic, even if she doesn't recognize it as such) to get rid of some books. When I do this, it makes me realize that I have many different criteria for what constitutes a "keeper" book. Georgette Heyer is firmly on my keeper shelf because she is my go-to comfort read. I am comfortable in Heyer's world, I understand her language, I know her stories, and I am perfectly aware of what she will give me. I even have multiple copies of some of her books just because I hate seeing them sad and unloved in a bookstore. And because I like the vintage editions much more than the new ones. There are other books I keep because they are favorites and I know I'll want to reread them or lend them to friends (only friends who give them back!). In this list are Lindsey Davis' Falco series and almost every fantasy novel I own. Quite a few of the mysteries, too. The Shadow of the Wind. I would say a bulk of my "keepers" are books I think others will enjoy, that I would like to have on hand to lend out (at my discretion!) when I need to do so. However, there are many books I don't anticipate reading again for years. Possibly for over a decade or more. But somehow, I never hesitate to keep them on my shelves. I just like knowing I have them. Maybe it's just me (though I doubt it), but some books, I form a deep emotional connection to. I feel like they helped define me, or mold me. They made me think or changed my perspective of a situation. They made me fall in love with them. Having them with me, on my shelf and close to me, makes me feel more secure. I feel as though those books have a piece of me in them, and the thought of giving them away makes me sick. Truly, it makes my stomach clench. What if Hilary Mantel's A Place of Greater Safety is picked up by someone who does not properly appreciate it? How could In Other Rooms, Other Wonders just languish on a shelf for years, feeling unloved? What if someone spilled coffee all over my beloved Persuasion? The possibilities are just too terrifying to think about. So these books stay with me, and I know they are safe and loved. It's funny, because even though I know I won't pick up the books in the last category for a very long time, it's really hard for me to let someone else borrow them, or even recommend them for someone else to read, especially if a) I don't absolutely adore the person or b) I don't know the person's reading tastes well. To me, recommending a book in that category, for which I have such a personal and immediate response, is like sharing a very private piece of myself. What if the other person doesn't understand the book? Or what if she does understand but doesn't like it? What if she doesn't connect to it the way that I did? I am ashamed to admit it as it makes no logical sense, but I totally judge people who dislike books that I love. I don't mean that I judge them harshly or negatively, but I step back and change the way I think about them. And because this is a pretty messed-up and disturbing reaction, I try my best not to give myself to get into the situation in the first place, and thus don't give the books away freely. Do you have a strong and deep connection to any books? Which ones? How do you define a keeper? I think my standards are actually pretty similar to yours. I REALLY have trouble getting rid of books. And books to which I form an emotional attachment - there is no way I will be getting rid of those EVER, even if I NEVER reread them. And then the books that I liked but am afraid I will forget about, I have to keep those, too. And then books that I would be comfortable lending out - I need at least two copies of those, so that I always have one on me. I totally understand how heroic your effort to get rid of books must be. It is SUPER hard for me as well. How much it impacts you emotionally is definitely what makes a book a keeper. Also, I believe, rather crazily perhaps, that everyone has a book that's 'theirs'. Something they can absolutely relate to. Something that's close to their heart. I'd never give away any of those. I usually get rid of books that I read when I was thirteen and don't really mean much to me now. I don't mind giving away Nancy Drew books, though I like them. I NEVER give away biographies or history related books. I have 3 versions of My Experiments with Truth by Mahatma Gandhi and I wouldn't get rid of any of them. It's a bit of a personal bond. Same with the book 'Nehru for Children' that I won as a prize for some contest at school. It's so memorable I can't give it away. I don't often recommend books to my friends or family for the same reasons as you. It's so disappointing when they admit that they didn't like it or even worse, they couldn't get past the first chapter. I've been thinking about the same think the other day, funny. I also have too many books and too little space in my tiny NYC apartment and I was thinking about getting rid of some books, but I couldn't bring myself to do it because I don't know which one to keep and which not. But I know that I'll eventually have to do it, and I think I will host a give away in the future. Great post, as always! I don't so much think negatively if a person didn't like a book I liked, but I do react very positively if a person loved a book I loved! In fact, when I saw that my husband-to-be had a copy of The Territorial Imperative by Robert Ardrey on his shelf, and found out that he loved it as much as I did, that's when I decided to marry him! "I totally judge people who dislike books that I love." But I do cull a lot. I cull books that I know I'll never want to read again, and if for some weird reason I do, I can get at the library. I cull books that I don't even remember a few months after reading them, books that didn't make an impression on me. I cull books that I thought I might like but tried to read and didn't, or books that I'm no longer interested in. I will even cull classics that I disliked! That gives me a nice balance, so that the 9 bookshelves in our house aren't overflowing, but none are bare either. I have a few comfort books that I don't loan out because I never know when I will need them. The only book I have consciously bought a second copy of, knowing the first copy was already on my shelf, was Robin McKinley's Sunshine, because I was worried I would wear out the first copy and then not be able to find another. I am reluctant to get rid of books that I didn't enjoy the first time I read them, because I am afraid that I will reread them later and find they are superb. Which happens just often enough to make this a rational concern. Apart from that, though, I don't have a lot of trouble getting rid of books, if I don't want them anymore. 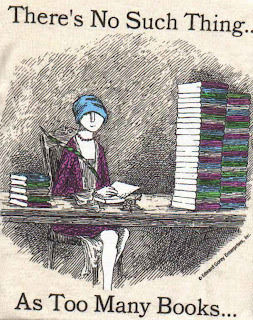 It's funny, actually, that you mention your concern that other people won't love the books as much as you do. I worry about that so much! And that's the exact reason I am okay with giving up books I don't care for. I never want to be the person who lets a book languish unloved on her shelves when someone out there would love it so much more. Honestly, I am far more likely to buy a book that I have borrowed from someone or somewhere else and read because I want to have my own copy than I am to get rid of a book. I keep most of the books I read. It wasn't until a couple of years ago I started giving a few away here and there. Ideally, my rule for keeping a book is that it's a book I want to read again or if it is a part of a series I am in the middle of reading (that way I can go back and reference it easily if need be). In the real world, I have quite a few books I probably never will read again but I haven't yet decided to give them away. When I was younger, I was ruthless about culling my book connection. I lived just around the corner from a used bookstore and used it almost like a library, buying and then returning books for credit. However, as I've gotten older, as I've found books that I'm more attached to emotionally, I find that I can't let go as easily. I have a relatively small personal library, mostly because I prefer to read books from the library and only buy my own copies if I deem the book special and worth rereading. Obviously, like everyone, I get the random birthday and Christmas presents that I have little lasting interest in. I have a sneaky solution for those: we have a family vacation home in California with a very poorly stocked library, so I drag them down there and leave them for family and renters to enjoy. I was going through my archives the other day, and I found a post from when I first began book blogging about how I don't really feel the need to OWN books so much as read them. And even though now I own a lot more TBR books thanks to book blogging, I still don't feel possessive about most of the books I own (my favourite authors excepted, but even then I don't own all of their books). So I find culling easy! I think it comes from moving around quite a bit growing up...books aren't nearly so charming when they've filled 20 moving boxes, lol. This a great post because people do have such an emotional attachment to books. I have moved so much and houses in SF are so small that I have to be pretty ruthless. I only have a handful of books that I think I will re-read again and other than that most of the books on my shelf are TBR books (of which there are far too many). Once I read them, I swap them or pass them on to someone who would like them. It's the only way I can justify this habit! Fantastic post, Aarti. As I accumulate more and more books, I try my hardest to only hold on to the ones that I absolutely adored (my five-star selection) or ones I feel I might need to reference in the future at some point (you never know, I might need to reference to Bitter is the New Black...). I have huge issues with getting rid of book as well. I always want to save them, because who knows, I may want to read them at some point in the future. 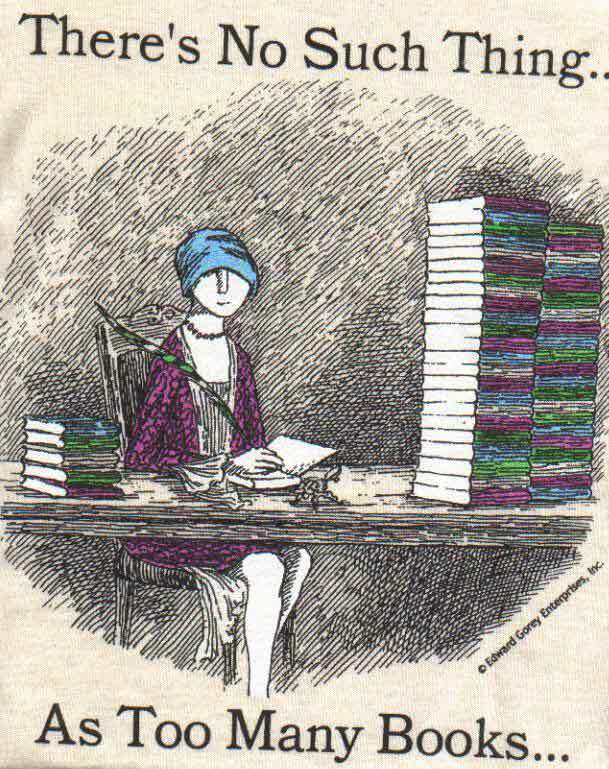 I think I started feeling this way after one of my binge shelf cleanings where I gave away a bunch of books that I really liked a lot, but wasn't sure when I would read again. After they were gone, I started thinking so wistfully about them, and have actually considered purchasing them again to replace my lost copies. My husband doesn't get it, but I totally need to be surrounded by the books I love and even if they are not absolute favorites, I feel that giving them away is somehow traitorous. I also totally understand what it's like to judge someone differently when they don't like a book that you feel is awesome, and I have done this to many people. I get what you're saying about trying to limit that reaction in yourself by refraining to recommend the book, and think that maybe that's what I should start trying to do. It almost feels like they are telling you that they don't like a part of yourself when they say negative things about a special book. I know that the emphasis and importance that I place on my books is weird to some, but I consider books to be my most prized possessions and love them more than anything else I own. I try not to think too hard about it when I purge books. I have two main criteria: 1) Do I want to read this book again? and 2) Is this a book I want my kids to read when they get older? Most of my books get swapped at Book Mooch or Paperback Swap, so I know I'll be getting another book in exchange for the one I'm giving up. It also means I can re-order a book if I give it up and decide I want to read it again. I keep almost everything I read, for two reasons. First, because my access to books is somewhat limited (books are very expensive here and I don't have access to a public library), so I get nightmares about the zombie apocalypse coming and me not having enough to read in my safe fortress :P Secondly, because it's not easy for me to get rid of books. There are no used bookshops where I can sell or donate them. I use bookmooch, but if I were to put everything I think I'll never read again on there, I'd go bankrupt with the shipping costs. Also, I know exactly what you mean about sharing certain books being a very personal thing. I have a different reaction to books than you. I rarely keep books once I've read them unless I know or think I'm going to re-read them. I'm building my dream library book by book, so if a book I've read doesn't touch me or make me think, I don't need to have it. I have no problem giving away books but do like to read them before I do. I do develop an emotional connection with my books. The ones that I read when I was first finding my identity in the world and discovering the injustices around me...those I will keep forever! Favorite authors...like you said, comfort books. These, too, will stay. In fact, I can't think of many books that I'll give away, except that I do have a stack that I'll be giving (some of them) away on my 2nd blogoversary for my first blog. These include some ARCs and some books that, once I had them, I didn't especially enjoy them, but I know that others will. Mass market paperbacks had to go when I moved. You're right. They don't shelve well! I did keep a few, though. At one point, I had my son build some more shelves so I could keep more! And I'm planning to buy another shelf...I found just the tucked away corner for it. Interesting to read your thoughts. I was just going through my books looking for things I might want to put on bookmooch, since it's about time I got some more room for new books. I find it awfully hard to part with books. I think Nymeth pretty much summed up most of my reasons for that: books are expensive in Europe in general (at least in the Netherlands they keep prizes artificially high) and even if they weren't I think I'd find it hard to part with them. The thought that you might not have liked this book now, but what if you want to read it in twenty years and would really love it? gets to me a lot of the time. I hate it when people don't have the same reactions to the books I love. So I always have to calm myself down by repeating that reading is subjective and reminding myself that I don't always like what others recommend either. But then when someone loves the book as much as you do, it's such an amazing feeling isn't it? I've moved house so many times that I'm used to giving away books.But certain books that I love will always be keepers, including those that I didn't get but want to try again. Great post! I smiled the entire way through this post!!! Personally, I've become a bit less attached the "physical" book than I used to be. This is not to say that I don't have hundreds of books that I will never part with, of course. But it eventually got to be an issue of my sanity having soooooo many books in the house. We're a family of five enormous book collectors (the youngest isn't so much a big reader, as he is simply a collector--of anything, including books, but also candy wrappers, bits of paper he "rescues" from the recycle bin, etc.). But if I just counted correctly, we have 23 big bookcases throughout our small home, and still have piles of books scattered around on tables and floors and dressers and... Really, it's sort of insane. And I finally knew that I just had to start letting go occasionally. Wow, I felt like you were reading my mind when you wrote this. I am a book keeper. If I like a book, even if I don't know if I will read it again, I keep it just in case. If I can't get through a book I keep it for when it will strike me again which could be years later but it has happened so I keep them. AS for lending, I'm terrible about that. Only a few people are allowed to borrow. I miss them when they are gone and worry about when I will get them back. I couldn't lend Wolf Hall to my cousin b/c I loved it so much I wanted it there for a spontaneous need to reread. Also I can't stand the idea of a loved book being unloved by someone I respect. I, too love my comfort books- Alice Hoffman, Carol Goodman. I can NEVER get rid of them. I keep all my non fiction and lots of fiction but I have culled savagely because I start to run out of room. I've been ever-so-slowly getting rid of my books to make room for new ones. I tend to keep books I think I'll re-read, ones I might reference, ones I think help represent me, or ones I will want to borrow to other people. But there are really no hard and fast rules about it other than a feeling. I think it really depends on how deep of an attachment I have to a book. If something has really touched me then I will keep it, especially if I know I'm going to read it again. Occasionally I will give away a book I've loved if I know I'm not going to read it again (for whatever reason - like it being too intense or upsetting, but still good). I also hang on to books that are gifts from my husband. I used to have a terrible time getting rid of books. I held on to almost everything. Then I ran out of room, and started really thinking about the books on my shelves. I realized that I had no intention of rereading most of them. I'd kept them not because I enjoyed them but because they were books. So I went through and culled. I removed anything that I didn't intend to reread (or refer back to, where nonfiction was concerned). I ended up with a much smaller library, but I was beyond pleased with it because every book on my shelves meant something to me. They were books that had touched me, or become part of my life in some way. As far as what makes a book a keeper: I find that I usually hold onto books with relatable, well-drawn characters, or with complex plots that I want to revisit. I also hold onto the odd disappointing series title, if the other books met this criteria. I used to have a couple of auto-keep authors, too, but these days Agatha Christie stands alone in this category. Everyone else ended up disappointing me so much that I went back to my usual "if it moves me, I keep it; if it doesn't, I don't" method. 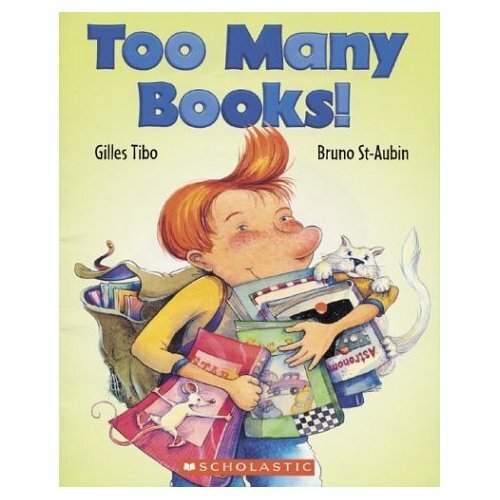 There is no such thing as too many books! I can't contribute anything fresh or new, Aarti, but I, like you, keep hold of books that one day I will re-read. Recently I have realised that with all of the books that I accumulate that there won't be time to read all of them plus reread all of those that I love. It is time to become ruthless in my culling. I loved your post, even though I'm entirely different. I do honestly try to pass on books that I've read, since I'm not a re-reader. The only exceptions are "classics" that I hope my daughter will pick up one day when she's older if I have them sitting around. Im a definate giver, I only have 3 books that I keep, the rest are given to the charity bookstore. But the same goes for my clothes and other items, If I haven't used it I give it or throw it away. I like the old Heyer editions too. With those stylized little illustrations on the jackets, and the (usually well broken in!) sewn hardcover bindings. I like to think of someone reading the old Heyers fifty years from now, just as I'm reading them after they were first published! Sorry I have not commented lately, but between being sick and work, I guess I missed this post totally...I do not tend to keep books once I read them, as I ALMOST never reread a book. I think I have 5-10 books that I've read, that touched me personally, that I kept, but unless there is that personal connection, it usually will not be a keeper. Have a good weekend Aarti. Question: Would the fact that I'm now debating whether the human beings need to move out in order to accommodate my book collection indicate that I have too many books?